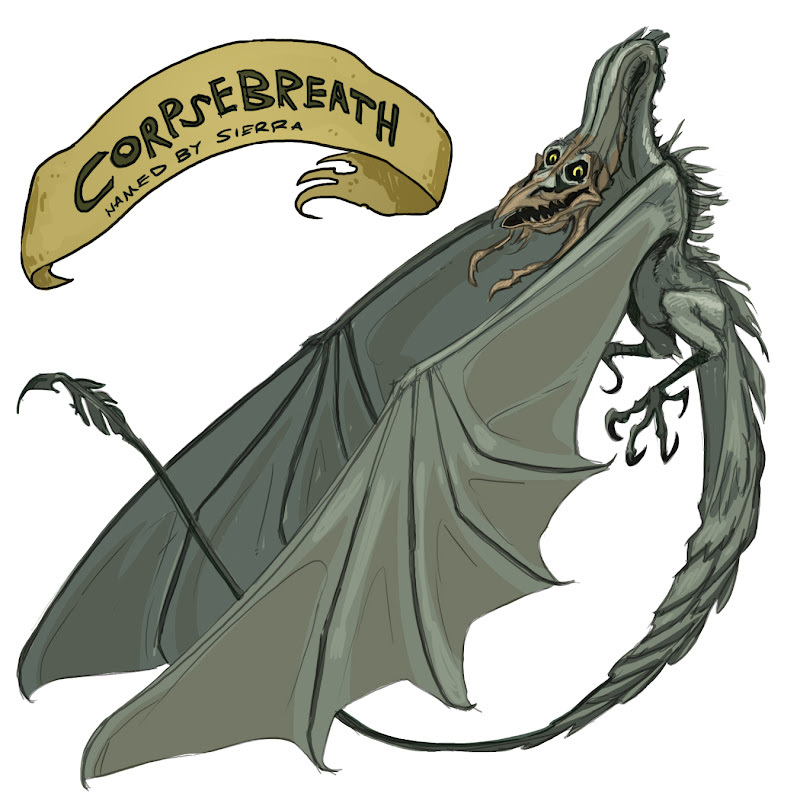 Today's dragon is a carrion-eating, graveyard dragon. Name it! We had a judging mishap last night. The judges fell asleep before we could do the name-judging process. I could have just picked one on my own--but that would be breaking the rules. I'll get the judges' choice tomorrow. That means you get an extra day to name yesterday's dragon! Good luck! In the highlands of Scotland grave robbing is not tolerated! Mac Abre protects the dead like he protects his food, well because the dead are his food. Mac isn't one for direct confrontation and would rather just use his toxic rotten gas (makes stink bombs seem rather pleasant) to suffocate and kill any intruders. Of course, Mac doesn't eat anything or one until they have reached the perfect level of putridity. So if you want to get buried in the Scottish highlands, make sure your grave is at least six feet deep! Mac doesn't like to dig. Hmm, I see others have the Scottish vibe also. I swear I named this before I saw those comments. Carbunckle- when there isn't a fresh corpse to nibble on, he goes for take out. He especially like small mammal road pizza with extra maggots, except for porcupines- they get stuck in his teeth. Skunk pizza, though- deelish! Kind of like having stinky French cheese on top. Nate, this one is just frightening - way to go! 1.Carbuncle- A painful localized bacterial infection of the skin and subcutaneous tissue that usually has several openings through which pus is discharged. Looks like Grimlaun to me.